Imagine that you’re enjoying a holiday with your family when suddenly the ground begins to shake and tremble. Buildings crumble and people run screaming through the streets. This is just what happened in Lisbon, Portugal on November 1755. At the time, Lisbon was one of the most beautiful cities in Europe with charming buildings, open plazas and cobbled streets. The Lisbon earthquake occurred in the Atlantic Ocean and the tremors could be felt through most of Europe. Many buildings in Lisbon were destroyed by the earthquake. What’s worse – fires from candles and cooking fires – spread to the houses. Soon, much of the city was on fire and people were running in panic to escape. Many people fled to the river and the sea where they boarded boats. Only 30 minutes after the earthquake, a tsunami came roaring into the city. A tsunami is a huge sheet of water, usually caused by an earthquake or a volcano. The flooding waters crashed the boats against the harbor. Many people drowned. What’s worse – fires from untended candles and cooking fires – spread to the houses. Soon, much of the city was on fire. When the tsunami was over, Lisbon lay in ruins. People all over Europe talked about the earthquake in Lisbon and it took many years to rebuild the city. 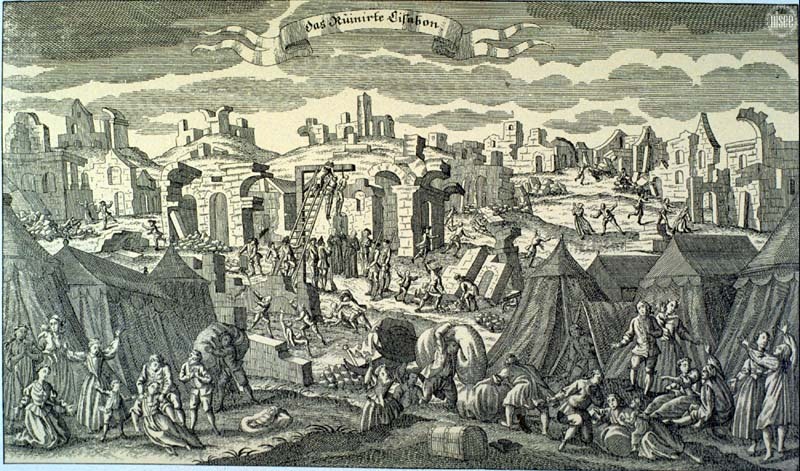 The Lisbon Earthquake happened on November 1, 1755. It was All Saints Day, a special day for the religious people of Portugal. Many of the people in Lisbon were worshiping in church when the earthquake happened. The fires that started that day burned for five days. Some researchers estimate that 10,000 to 100,000 people died, making it one of the deadliest earthquakes in history. The Lisbon earthquake was felt in Finland and North Africa and even in Greenland and the Caribbean. The royal family and court were not in the city during the earthquake or tsunami so they were unharmed. After mass that morning they had all left the city because the king bowed to the whim of one of his daughters. She had wanted to spend the holiday outside of the city and so they did. After the earthquake the king became afraid of living within walls. A complex of tents and pavilions was erected on the outskirts of Lisbon where the king and his court stayed until the king died. His daughter built the new palace on that same spot. The Great Lisbon Earthquake was the first earthquake studied scientifically to evaluate its effect over large areas. Because of this huge earthquake, modern seismology was developed. Check out this cool video all about the Great Earthquake of Lisbon for kids. 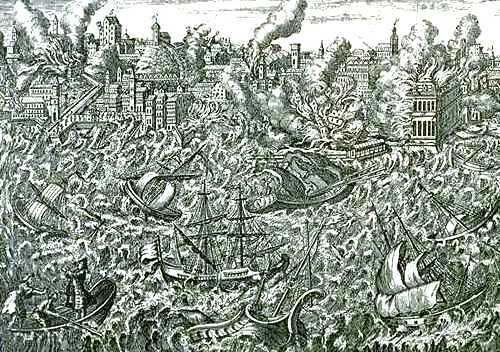 This video shows and tells kids about the 1755 Lisbon Earthquake. Question: Do tsunamis happen often? Answer: Tsunamis are fairly rare, but when they occur, they can be devastating. The last major one happened in 2004 in the Indian Ocean. Over 230,000 people died. Enjoyed the Easy Earth Science for Kids Website all about the Great Earthquake of Lisbon info? Take the FREE & fun all about the Great Earthquake of Lisbon quiz and download FREE all about the Great Earthquake of Lisbon worksheet for kids. For lengthy info click here. Declan, Tobin. " Great Lisbon Earthquake Kids Facts ." Easy Science for Kids, Apr 2019. Web. 21 Apr 2019. < https://easyscienceforkids.com/all-about-the-great-earthquake-of-lisbon/ >.